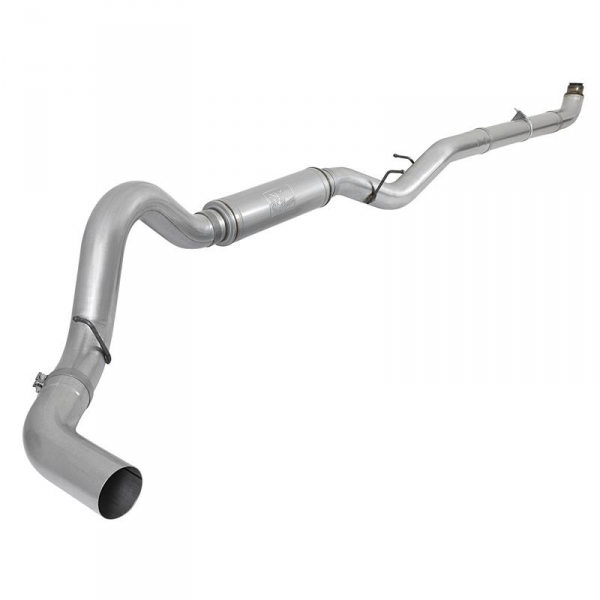 The AFE 49-04060 ATLAS 5" Downpipe-Back Race Exhaust System for your 2001-2010 GM 6.6L Duramax features a 5" mandrel-bent aluminized steel tubing for maximum flow increased horsepower, increased torque and lower EGTs. This system uses high quality band clamps, OE-style bayonet hangers and includes an adjustable hanger clamp for a tight secure fitment. This unit uses all factory mounting locations this provides for a quick, hassle-free installation. AFE ATLAS exhaust systems are the perfect combination of performance, fit and value. Leak-Free Seal High quality band clamps are included for a complete 360 degree sealing surface. OE Fit OE-style bayonet hangers are used to maintain a stable pipe location during high vibration and high heat conditions. The bayonet tip holds the hanger bushing in place for an OE-style fit that does not change with time. Flow and Performance: This ATLAS exhaust system is constructed of 5" mandrel-bent aluminized steel tubing for maximum flow. Smooth transition bends allow for low turbulence, increasing horsepower, torque and lowering EGTs. This aluminized steel performance muffler is designed to provide a deep, throaty, powerful sound on acceleration, but maintain a smooth sound at idle. This muffler is constructed of aluminized steel and uses a straight through perforated core with heat resistant packing to reduce backpressure and maximize exhaust flow. You will see increased performance and improved throttle response over the factory exhaust. Also featuring a stamped aFe POWER logo for an aggressive style. Muffler Specifications: 5" Center Inlet /Outlet, 7" Round x 24" L body diameter. Fitment Note: Fits Crew Cab/Short Bed, Crew Cab Long Bed, Extended Cab/Short Bed, & Extended Cab/Long Bed. Not for use on Cab & Chassis.